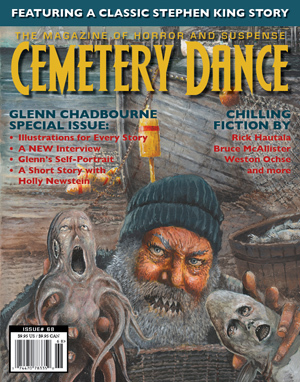 Just a quick note to report that a new 5,000 word short story of mine, THE CAMBION, has been accepted for publication in Cemetery Dance magazine. I’ve long been an admirer of this fantastic genre publication, so it feels like a minor acheivement to be appearing within its pages. They closed to submissions for several years to clear the backlogged stories, so my tale might not appear for quite a while. More info as I get it. Well done mate. I think it’s rather more than a minor achievement. Look forward to reading it. Thanks for the kind words, Ross. It means a great deal to me. Hi Steven! I was trolling Google looking for any signs of people receiving responses from Cemetery Dance. They’ve had mine since late January. I’m not sure if that means it made it past the first reading, or if they’re just really swamped with submissions. Anyway, just wanted to drop a line to say congrats! They’re a classy publication, as you know, and are very selective in their submission process. You should be proud! Thanks for the kind words. Yes, I’m very pleased to be appearing in Cemetery Dance. It’s long been one of my favourite magazines. I wrote the story especially for it, once I heard they were opening up a submission window. I sent my story in mid-December and heard early April (I think I may have been one of the first to submit). Fingers crossed that your submission is under consideration. Best of luck with it. Thanks for checking by.